What is the best use for this table? This table is an economical choice, perfect for lighter duty applications. If you are using this table for foodservice, we recommend using a table cover to protect and extend the life of the top. 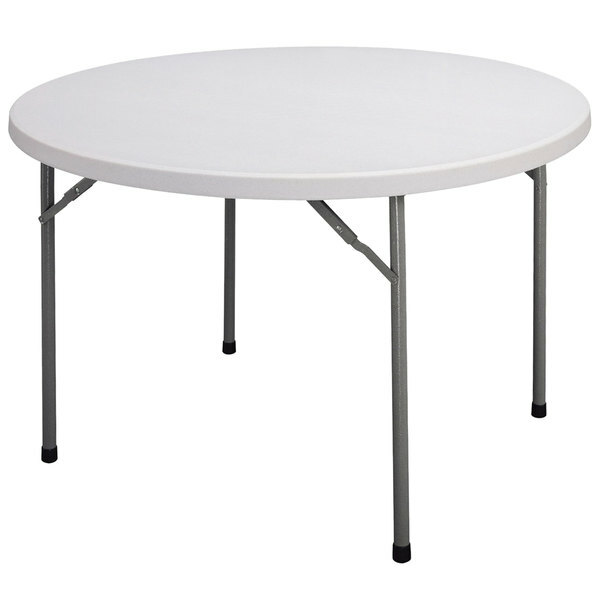 Offering exceptional versatility, this Correll CP48 33 48" round gray granite blow-molded plastic economy folding table features a standard 29" height and can be paired with compatible chairs to offer your guests a place to sit at banquets, meetings, and parties. Not only is the durable blow-molded top waterproof to ensure the table is safe from rain or accidental spills, it is lightweight, scratch, stain, and chemical resistant, and perfect for light-duty applications. Plus, it can easily be covered with a tablecloth to suit upscale settings. Featuring a charcoal frame with 1 1/8", 14 gauge steel legs on mar-proof, plastic foot caps, this table provides superior stability and folds up nicely for easy transportation and storage. 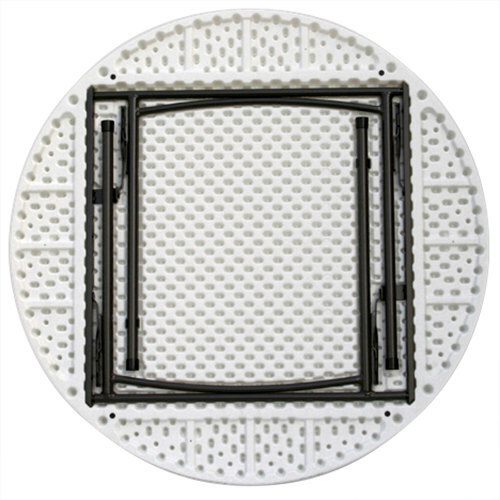 When ready for use, the legs simply lock back into place with an automatic lock-open mechanism. Boasting an evenly-distributed weight capacity of 250 lb., this economical table is an ideal addition to offices and social functions. This product can expose you to chemicals including Lead and Lead Compounds and Formaldehyde (gas), which are known to the State of California to cause cancer, birth defects, or other reproductive harm. For more information, go to www.p65warnings.ca.gov. WARNING: This product can expose you to chemicals including Lead and Lead Compounds and Formaldehyde (gas), which are known to the State of California to cause cancer, birth defects, or other reproductive harm. For more information, go to www.p65warnings.ca.gov. Five to six people can comfortably sit at this table.